Bassist Victor Wooten is returning to St. Louis to perform at 8:00 p.m. Tuesday, April 16 at the Old Rock House. The show is billed as "The Wooten Band and the Wooten Woods Experience," the latter referring to the bassist’s Center for Music and Nature, an educational retreat located near Nashville. Along with music from Wooten, his brothers Regi and Joseph Wooten on guitars and keyboards, and Derico Watson on drums, the evening apparently will include an "audience participation demonstration" related to the educational programs offered at the Center. 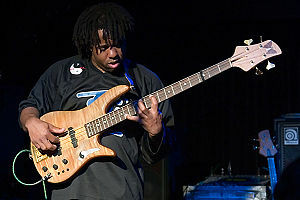 Wooten (pictured) most recently played St. Louis with drummer Dennis Chambers and saxophonist Bob Franceschini in March of last year at the Old Rock House. Tickets for Wooten Band's all-ages show in April are $32 for general admission, and are on sale now via all Metrotix outlets.